May 12, 2014, 2:59 PM · This new coaster tech series is going to look at the different major types of roller coasters around the world, and how they differ from other types and each other. This first piece will cover one of the most popular styles of roller coasters outside of standard “sit-down” coasters — namely, inverted roller coasters. Not to be confused with suspended coasters (such as Ninja at Six Flags Magic Mountain and Flight Deck at Kings Island), inverted roller coasters are characterized by seats positioned beneath the tracks that allow riders’ feet to dangle free. Most inverted roller coasters have some type of inversion or loop, but there are some around the country designed for kids and families that are completely free of inversions. The one drawback of the design is that riders not seated in the front row are “flying blind,” as it can be difficult for riders, particularly inside ones, to see what’s coming, or to feel the rush of wind in their face. This typically creates extremely long lines for front seat rides, but those that have come to love inverted coasters have probably discovered that the ride is just as good, if not better, in the back row, where forces tend to be more intense. 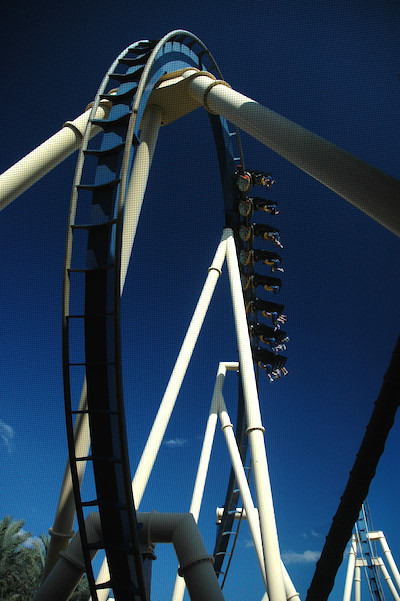 In 1992, Bolliger and Mabillard introduced the world to the revolutionary inverted concept with the opening of Batman: The Ride at Six Flags Great America, outside of Chicago. The coaster was so popular that there are a dozen clones and mirror-clones (same layout except starting with a right turn off the lift instead of a left turn) of the ride all over the world. BTR and its many clones feature a layout the is about as intense as they come, with no mid-course brake run (MCBR) and a non-stop barrage of maneuvers that at the time was unlike anything on the planet. Add to that a level of theming that was pretty impressive for Six Flags parks, complete with a Batmobile outside the queue entrance, and B&M had a hit on its hands. 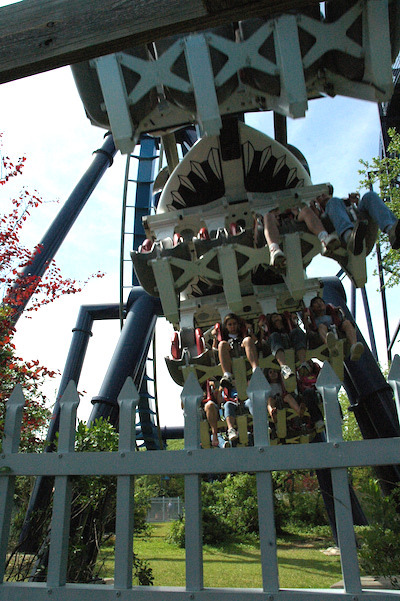 The B&M inverted design also employed a four-across seating arrangement that was seen previously only on B&M stand-up coasters (starting in 1990 with Iron Wolf at Six Flags Great America, later relocated to Six Flags America in 2012, as Apocalypse). The design allowed the designers to create a relatively high-capacity ride with a relatively small load platform (8 rows), and doubled the number of front seats, some of the most popular on any roller coaster. As BTR clones started popping up around the world, B&M also worked on custom inverted coasters for a number of parks that have become part of any coaster aficionado’s bucket list. While B&M’s first custom invert, Flight Deck (formerly Top Gun) at Great America in California, does not rate particularly high, the list of custom inverts that followed is about as good as it gets. Nemesis at Alton Towers with its predominantly underground layout, Raptor at Cedar Point (the first six-inversion inverted coaster), Montu at Busch Gardens Tampa (the first seven-inversion inverted coaster), Alpengeist at Busch Gardens Williamsburg (still the tallest non-launching inverted coaster in the world), Afterburn (formerly Top Gun) at Carowinds, and Talon at Dorney Park are all must-rides for any coaster fan on the planet. Each one is similar, but with a unique character and similar elements that feel completely different with different sequences. I frequently ponder which one of these incredible coasters is the best, and my own opinion varies typically deferring to the one I rode most recently (I have yet to ride Nemesis though). Raptor at Cedar Point is a people-eating machine that is operated at peak efficiency throughout the Sandusky park’s season. The layout is relatively compact compared to other custom inverts, but it packs a ton of elements into a small footprint. 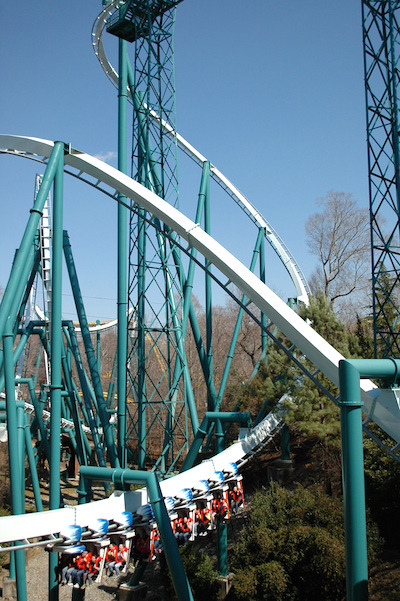 Alpengeist and Montu at Busch Gardens Williamsburg and Tampa, respectively, took the inverted concept to new levels. Montu, themed around an Egyptian myth, combines a pulse-pounding layout with a design that has riders constantly confused as to which way is up. With ravines and numerous underground sections, including an uber-intense Batwing, Montu’s track is about as unique as they come. Meanwhile, Alpengeist probably features the most cleverly themed inverted roller coaster on the planet. With props and design elements to make the coaster look like a runaway ski lift, the coaster is quite possible one of the best-themed “big” roller coasters in North America. Afterburn at Carowinds features a Batwing element like Montu, but instead of using ravines and tunnels, the jet-themed coaster instead uses trees and the park’s natural terrain to conceal the most interesting maneuvers. Throughout the 1990’s, a number of Vekoma-designed clones (known more commonly as the Vekoma Suspended Looping Coaster – SLC) were built around the country. From Mind Eraser at Six Flags America to Kong at Six Flags Discovery Kingdom to Thunderhawk at Michigan’s Adventure, the Vekoma SLC spread like the plague, bring head-banging, uncomfortable, and rough rides to all corners of the globe. The design almost gave the invert a bad name. In 1998, Intamin built its first inverted roller coaster, which to this day is still the fastest complete circuit inverted roller coaster in the world. 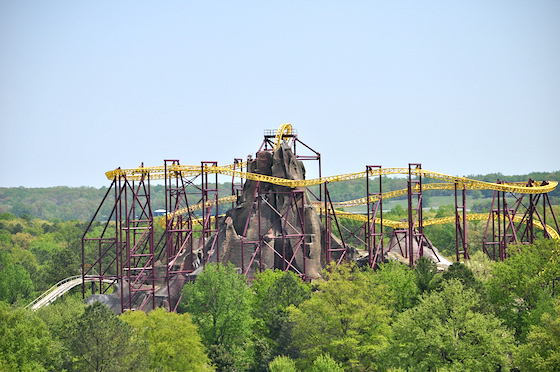 Volcano: The Blast Coaster, at Kings Dominion in Virginia, literally blew the Vekoma SLC design away. It features a linear induction motor launch from 0 to 70 out of the top of a 155-foot volcano. While the overall design of the coaster is rather pedestrian after the explosive departure from the mountain, featuring a series of slow barrel rolls and turns, it’s still one of the most unique coaster experiences in the country. In 1999, B&M took the inverted coaster to a whole new level with the installation of two intertwined inverted roller coasters at the newly-opened Islands of Adventure in Orlando. 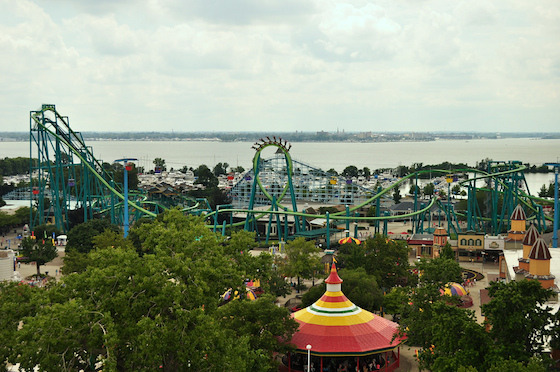 Dueling Dragons, while individually not the greatest inverts, worked together to create a one-of-a-kind experience full of near misses, flybys, and a climactic game of roller-coaster chicken that has the trains speeding towards each other until flipping away at the last moment. This is accomplished through a very complicated lift system that can weigh each train on the ascent to ensure both trains traverse the course at the same time, to optimize the timing of the interactive elements. 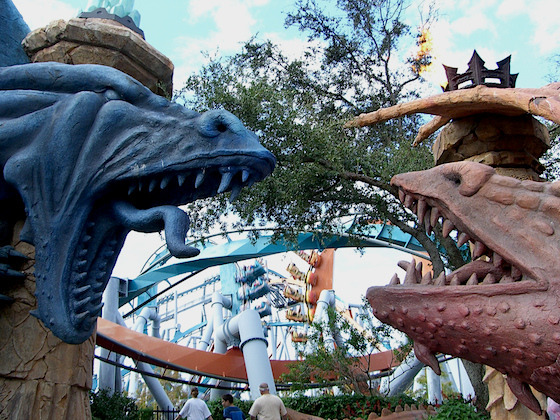 Sadly, mischievous behavior by riders on Dueling Dragons, renamed Dragon Challenge when The Wizarding World of Harry Potter debuted in 2010, caused Universal to ceasing “dueling” operation on the coasters, and they are deliberately dispatched to eliminate the interaction between the trains. At the turn of the century, inverts began to fall out of favor, but there were still some notable installations. 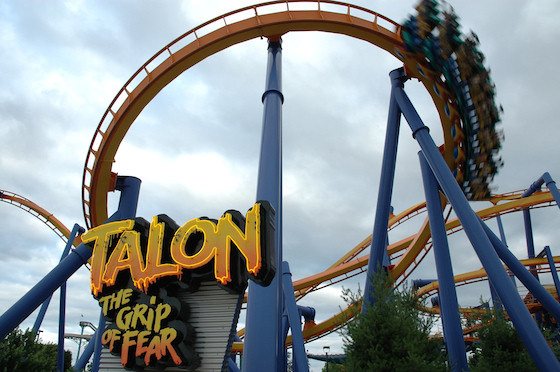 Dorney Park’s Talon was one of the first coasters in the world to feature sound dampening features, in the form of sand and foam in the track supports to reduce the decibels of the roaring train, necessary to comply with Allentown’s sound ordinances. Similar to the BTR design, Talon is devoid of an MCBR with a layout that maintains intensity throughout. B&M also brought the United States more custom-layout inverts, in the form of Silver Bullet at Knott’s Berry Farm and Patriot at Worlds of Fun. Both designs are far superior to any of the Vekoma SLCs, but were not early as special or unique as B&M’s previous custom creations. With virtually every park in the country already featuring an inverted coaster, the style fell out of favor in the United States for years while parks installed floorless coasters, hyper coasters, dive machines, and flying coasters. That was until 2014, when B&M returned to the US with a new custom inverted coaster design featuring a new restraint style similar to those used on their flying coasters. Banshee at Kings Island has opened this spring to rave reviews, and features some unique elements along with a layout without a MCBR. With inverted roller coasters in just about every theme park in the United States, and in hundreds of parks overseas, the success of Banshee may not necessarily signal a renaissance of the design, but perhaps a reminder of how incredible it is to ride underneath the rails. May 12, 2014 at 3:54 PM · I really miss the old Dueling Dragons. A brilliant attraction all around. Still like it though. 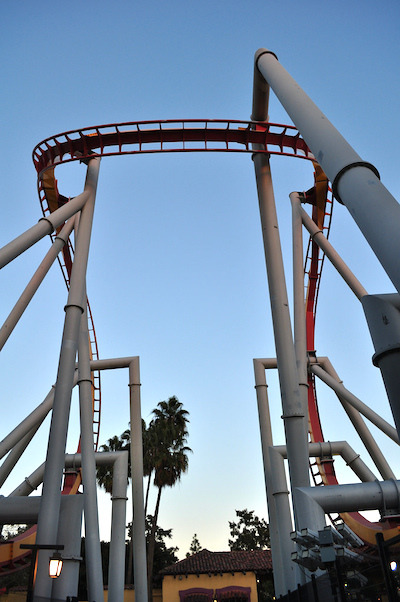 May 12, 2014 at 4:27 PM · This makes me want to take a world tour to ride all the inverted coasters out there. My favorite at the moment is Montu. I love how it takes advantage of the ground, and it packs a thrill. I'll be riding Banshee this October. I can't wait to see what B&M can do now with the inverted design after years of not building one here in the states.... Time to go spend some time on YouTube. This was really well written... Thank you. I would love to see one on the hyper coasters with B&M. May 12, 2014 at 8:17 PM · I have a penpal just north of London who helps me with my English accent, and I'm planning a trip to see her. I am not leaving the UK without riding Nemesis! I love B&M inverted coasters. Truly, riding beneath the track is my favorite type of roller coaster. May 12, 2014 at 8:53 PM · Thanks Russell. Really appreciate the topic of this well written article. I have been a fan of inverts since the early days and love the B&M incarnations of them. I've ridden a few of the Vekoma "hang and bang" designs and feel the nickname is well deserved. I have experienced most of B&Ms mentioned in your article and have to say my favorite is Montu. Being avid skiers, my kids and I enjoyed the theming of Alpengeist but felt that bigger did not always mean better. I hope to make it up to Kings Island soon to try out both Banshee and Diamondback. May 13, 2014 at 8:09 AM · Great article, Russell! I appreciate the research and the thoughtful analysis. If a park has a B&M inverted coaster, that's usually my first and most frequent coaster ride of the day. They're a great way to start and end the day at a theme park. As far as the Vekoma inverts go, what a disappointment. I'll ride them, but Vekoma inverts look paltry when compared to B&M inverts. The double LIM launch element to Volcano: The Ride is awesome, and then they do so little with the subsequent elements. It's a shame they waste all of that kinetic energy on weak elements around the volcano when the ride would be more visually appealing if the track were routed away from the mountain, and a few more loops and rolls were added in before the track returns to the volcano. May 13, 2014 at 11:02 AM · The Vekomas are really complete crap, so much so that I was unable to find any photos amongst the thousands of theme park pictures I have in my digital collection (I think I have a slide somewhere from Geauga Lake, but I'm still in the process of digitally converting my slides). The second half of Volcano makes sense thematically since the train slowly makes it's way around the volcano like lava oozing down the side of a summit. It's not the most interesting or exciting, particularly after the amazing launch, but it works in context. The fact that the designers built the coaster around an existing structure (former Haunter River shoot the chutes attraction), meant they were probably limited with what they could do with the layout. They also had to work around another roller coaster, Avalanche, directly adjacent. Volcano has a very interesting history...Intamin was a little ahead of their time (similar to what happened with Top Thrill Dragster) and the first year of Volcano's operation occurred with trains with half the number of seats as originally designed. The launch (there was initially just one) was not powerful enough to reliably push a fully loaded train over the top, so to reduce weight, the even numbered rows were removed, meaning the capacity was 8 people per train. When they finally added the second booster launch, right before the track twists upwards, the master controls had difficulty timing the second launch to actually accelerate the trains, and frequently it would slow the train because of the poor timing. It took nearly 3 years to get it right, but it's been running pretty consistently since. Lesson---Don't expect to run an Intamin coaster at full capacity in the first year plus of operation. May 13, 2014 at 11:19 AM · Excellent article, Russell. And I'm glad that you mentioned several coasters of particular interest to me. It took about two years from the time I took up riding coasters to the time that I had any interest in riding inverts and I used to stand on the loading platform of Nitro and watch Batman, feeling very glad that I wasn't on Batman. Now I feel completely differently about Batman, which gets high marks for intensity. I didn't think that anything about Volcano was pedestrian; the 155-foot rollout was, after all, the longest inversion on any coaster until it was broken by Gatekeeper last year. It was on the trip on which I rode Gatekeeper that I first rode Raptor. I'd always bypassed Raptor because there were coasters I found more interesting but the queue was short and blimey, that turned out to be one good ride. As to Talon, this is one of my favourite coasters of all time - which is a good thing, as I'll be participating in Coasting For Kids at Dorney on June 8 and Talon is one of the three that will be part of the marathon. May 13, 2014 at 1:54 PM · Talon is seriously underrated. The finishing helix is one of the best on any roller coaster, invert or not (right up there with Goliath/Titan and Drachen Fire (lament). I love it because it's so quiet. When it test runs in the morning with no passengers, you can be standing right next to the sign and not know it's running until you see the train fly past. When there are people on it, the only thing you hear is the people screaming, which is a big departure from most B&M's which have a distinctively loud roar, which gets louder over the years (Kumba is practically deafening these days). May 14, 2014 at 5:34 AM · Good point Russell, about the track on Avalanche affecting what Kings Dominion could do with the layout of Volcano. They're closer than I realized, and with Flight of Fear limiting any track going to the south, I quess they did about the most they could with the existing space and structure. I also didn't realize that they added the second set of LIMs on the approach to the volcano at a later date. It seems odd that Intamin didn't over-engineer the original design, but I suspect that limited funding coupled with the fact that the ride goes into a hard turn right after the first set of LIMs set a ceiling on what they could originally do. You and Bobbi are spot on about Talon. A great coaster in a nice park that doesn't seem to get the appreciation that they deserve. There seems to be an unwritten rule in eastern Pennsylvania that families go to Hersheypark and teenagers go to Dorney. I don't get it, because Dorney has a nice atmosphere with a good mix of rides. Rollercoaster enthusiasts in the Washington D.C. area are so lucky. Six Flags America nearby (okay, maybe not so lucky), and Kings Dominion, Busch Gardens Williamsburg, Hersheypark, Dorney Park, Knoebels, and Kennywood all within a few hours drive.